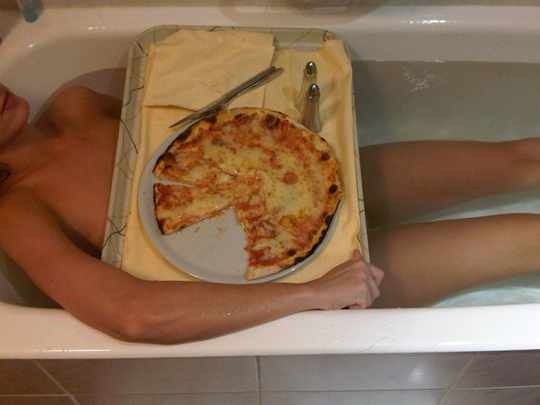 Katy Perry posted the above photograph to Twitpic of her taking a bath with a pizza, strategically covering her more naughty parts. The image's title: "I have no self control." Does she mean "I can't control myself and ate a whole pizza"? Or does she mean "I can't control myself and posted a semi-naked photograph of myself on the internet"? In any case, sometimes she wears the food (like her infamous sushi dress), and sometimes the food wears her.